[Text page with male siamese twins, a man headed lion, and a bridge collapsing under a group of dancers at Maastricht, The Netherlands. ] Etas Mundi. Foliu. CCXVII - SCHEDEL, Hartmann. Title : [Text page with male siamese twins, a man headed lion, and a bridge collapsing under a group of dancers at Maastricht, The Netherlands. ] Etas Mundi. Foliu. CCXVII. Map maker : SCHEDEL, Hartmann.. Size : 13.8 x 8.7 inches. / 35.0 x 22.0 cm. 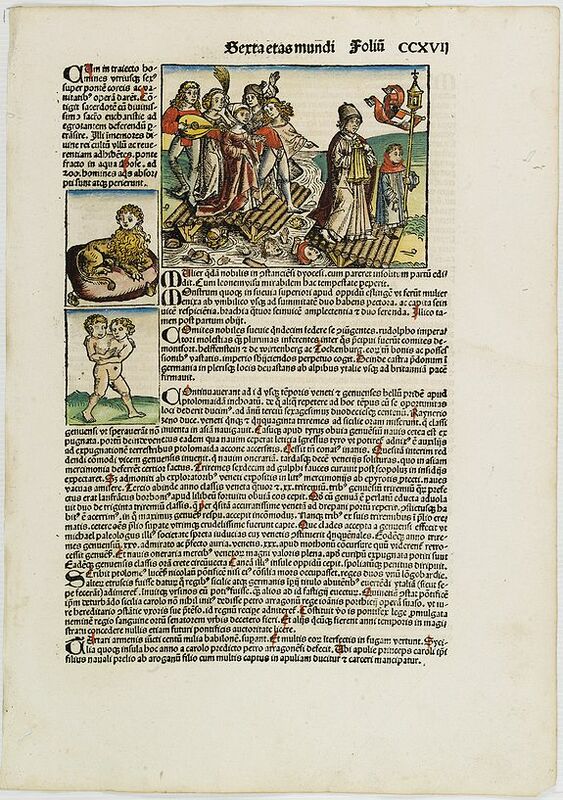 Description :Latin text page with woodcuts of male Siamese twins, a man headed lion. The large illustration is the only illustration related to the Netherlands : it shows a bridge collapsing under a group of dancers at Maastricht. The story is that the dancers did not obey respect to a passing priest and as punishment the bridge collapsed and 200 people where killed. The verso side is printed with Latin text and depicts Popes Martinus and other, and a scene of two men holding back a sea lion with a fishing net. Condition : Some overall toning. Dark impression on large sheet. Very good condition.